Through to the semi-final of the CUFL Premier Division after a hard fought win over UCC, the senior soccer side have had an altogether positive 2013 and manager Declan Roche couldn’t be happier. “We hope to get to the final. We set out to qualify from the group, and to get through the quarters and to win that was a huge achievement. Now, we’ve to try get to the final and win it. Taking into account a few mixed results in the group stages, Roche said it was important that his side remain strong defensively in order to win the division. “We conceded some goals… in the games we lost; we were quite good in the games. We dominated a lot of play. At UCD away we were outstanding and we lost. So we just need to tighten up and stop conceding goals. A very physical encounter with UCC in St Clare’s tested the resolve of many of the players. However, the side came through the tie under the guidance of captain Robbie Gaul. “I think they [UCC] proved to be very tough opposition. That UCC team are the top of the Munster Senior League, the top league down there. 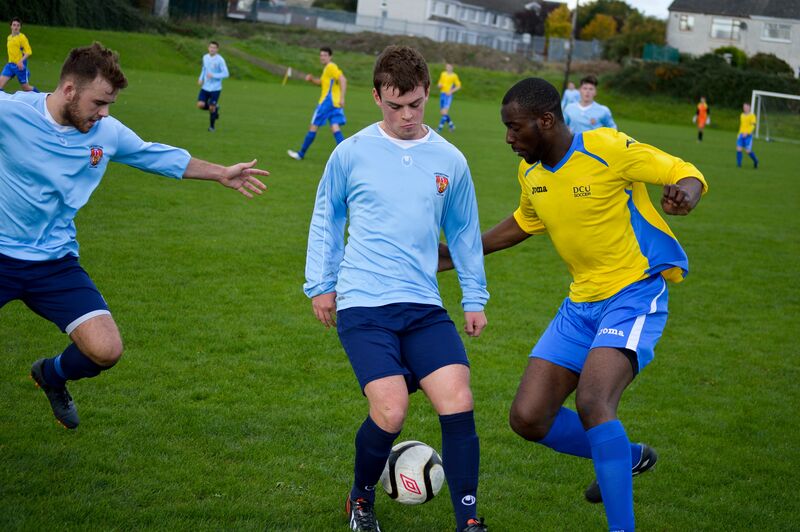 They don’t just play university; they represent UCC in the Munster Senior League. Looking at the year as a whole, Roche found that the support and the effort put in by the side in early morning training sessions were at the forefront of their success and progression over the past 12 months. “Fran Butler [Soccer Development Officer in DCU] deserves a lot of credit. He’s been tremendously supportive of the management team. When asked about funding for the senior team, a fraction of what the likes of the football or hurling sides would get, Roche seemed more concerned about guiding his side to campaign success rather than focusing on figures. Heading into their semi-final against Carlow, it’s clear that Declan Roche and his charges have high hopes for the upcoming year, and with a year as beneficial as 2013 behind them, it is the perfect platform on which to compete at the top level.